A Hungarian-style comfort food that's both healthy and heartwarming. Fall means it’s time for recipes just like this. The ones that tempt and taunt you with smells emanating from an oven that you are trying desperately not to peek into. Hot tip: Don’t snack on the bread while you wait, you’ll want to be good and hungry to appreciate these. They will be worth it! 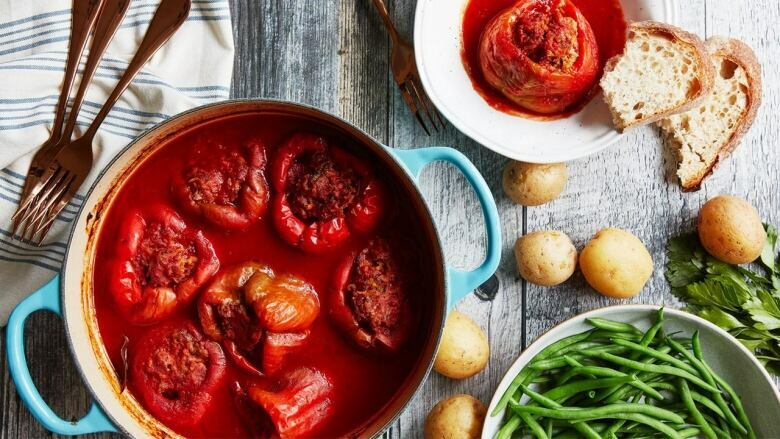 These Hungarian-style stuffed peppers are a rustic and comforting dish. Serve with green beans, boiled potatoes and a crusty bread for sopping up the sauce. Preheat oven to 375F degrees. Heat oil in a skillet set over medium heat. Cook onions and garlic for 5 to 7 minutes or until very tender. Stir in rice. Season with ¼ tsp each salt, pepper and smoked paprika. Cool completely. Meanwhile, cut off tops of peppers and scoop out seeds; discard tops and seeds. Cover and bake for 1 to 1 ½ hours or until the rice is cooked through and peppers are very tender. Remove bay leaves before serving. Sprinkle with more parsley if desired before serving.